It may come as a shock to a reader who has followed this page for a decade, but Osaka's most unique contribution to world theater culture is not its kabuki actor woodblock prints. Rather, that honor goes to bunraku (also called ningyô jôruri), the extraordinary stage tradition that marries virtuoso puppetry to dramatic narrative chanting, the whole accompanied by rhythmic shamisen. Thanks to inspired collaborations between playwright Chikamatsu Monzaemon ("Japan's Shakespeare," 1653-1724) and two exceptionally-gifted chanters, (both named Gidayû), a humble folk-puppet tradition got elevated to the level of universal art, with a broad repertory extending from profoundly moving tragedies to musical comedy. 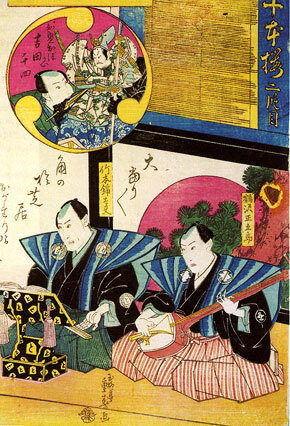 By the mid-18th century, Osakans were flocking to day-long performances. They embraced this theater as subtle and refined and, perhaps recalling the puppets’ origins as mediums to the gods — almost as sacred and transcendent as Nô. And it was intriguing and ingenious. Famously, in this form of puppet theater the trick of suspension of disbelief is somehow achieved despite each intricate doll — half life-size — needing three men on stage to manipulate it! But public taste evolves. The first decades of the 19th century saw the emergence on the Osaka scene of a pair of competing mega-celebrity human actors — larger than life — and this cemented a shift from puppet to kabuki patronage already begun some years earlier. Which leads us to our featured print (Fig. 1), a 5/1831 design by the well-known Osaka artist Shigeharu (1803-53). Sitting with plectrum and lectern, (note the sophisticated elegance of the latter, decorated with the lowly "pawn" piece from Japanese chess), are a shamisen player and a Gidayu-style chanter. The title informs us that this is the 2nd act of the classic Genji-Heike war tale, "Yoshitsune and the 1,000 Cherry Trees" (Yoshitsune Senbon Zakura). The Heike general Taira no Tomomori doll can be found in the insert, handled by master puppeteer Yoshida Senshi. Barely visible in black, as they manipulate the warrior’s left hand and feet, are Senshi’s two assistants. The surprise twist here is that the setting for this performance is the Kado Theater, a major venue in Osaka… for kabuki! Indeed, another print recording a different play from the same day’s program shows Senshi standing behind and pretending to manipulate the human actor Nakamura Utaemon III, one of the aforementioned idols responsible for kabuki's predominance. True, the occasion of a staging of the "Yoshitsune" play must have led naturally to thoughts of creative cross-over; the 1747 drama enjoyed equally long histories with both traditions. On the other hand, the two performance arts, though forever linked artistically, were still box office rivals with distinctly loyal fans, making cooperation nearly unthinkable. A fair assumption is that the collaboration was part of some impresario's dream to amuse the public with a synergistic innovation, and both troupes agreed because they saw in it a chance to woo away a section of the other's audience. Then, too, Utaemon had a puppeteer relative; maybe the superstar's clout alone was enough to "get the deal green-lighted." In the event, at least one of the two factions was bound to wind up displeased, and, sure enough, the brave experiment seems never to have been repeated. What about prints commemorating a purely bunraku performance in a puppet theater? Curiously, fewer than a handful are known from the ukiyo-e era — one showcasing the obviously popular Senshi. One reason for this rarity is that the true heyday of bunraku preceded the 1790s advent of Osaka single-sheet printmaking. Conversely, by the time of the explosion in ukiyo-e production in the 1820’s, the potential market for puppeteer/chanter imagery had been greatly reduced. Indeed, it is possible that puppet fans, who saw themselves as more highbrow, may have even felt disdain for "kabuki-like" bromides.